Here we go again with that all-familiar feeling of disbelief that, holy cow, it is already October. Q3 was quite an adventure so, with all the fun we were having, I guess we lost track of time! 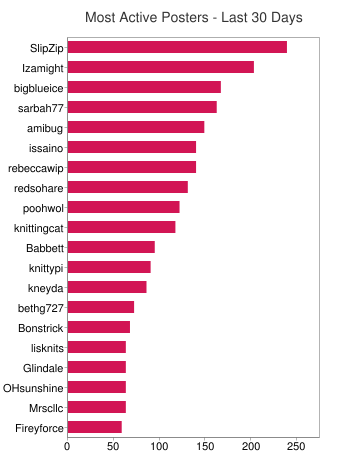 You guys were testing the waters of the addictive world of spinning, showing off your fluffy pets to earn the Woof & Meow badge, being super supportive to one another on the Ravelry forums, and so much more! We hope to keep all the action going in Q4 so read below to see what’s in store. Just like Q3, we will be focusing on 3 KALs which we will all vote on at the end of the quarter. The last 3 KALs to round out the year are: Selfless Knits, Felting, and Chunky Knits. Speaking of voting, who won the Q3 $20 store credits, you ask?!? The credits have already been added to your accounts – congratulations! A big thank you to everyone for submitting and voting!! You can submit your completed projects and badges via your Yarnathon dashboard. We’ll be reviewing submissions as they arrive, but please allow 1-2 weeks to receive your credits. We are in the 4th quarter so we are going to put you all to the test you all with a team challenge! You, along with your Yarnathon teammates, can earn points towards your teams total by completing 1 or all of the mini-challenges. Teams can win 1 virtual finisher per part of the triathlon. Will there be a clean sweep from one team or will 3 teams win a finisher each? We can’t wait to see what happens! You can also earn your Team Spirit badge by earning 5 points for your team. The submission deadline is December 25th at 12 AM Eastern to allow for scoring and awarding of finishers before the end of the year! We have zoomed in on the logos of some of our dyers. Your job is to correctly identify each logo! Correctly identify all of the logos and you will earn your team 1 point. Type your answers in the blanks of this PDF. We love a classic word scramble puzzle so your job is to unscramble the letters of random knitting-and-ESK-related words and solve the final word to complete the riddle. A complete and correct puzzle earns your team 1 point. Type your answers in the blanks of this PDF. Admittedly, we had way too much fun creating this puzzle! Your job is to correctly identify 15 Madelinetosh colorways as represented in picture form in the collage. We have thrown a few pictures in to trick you so be careful! Type your final answers into the blanks below the picture on this PDF. NOTE: PLEASE fill out the forms completely with your ESK username, e-mail address, and team name to receive your credits! You will earn 1 point for each piece that you knit using only your team colors, up to 3 points per person. Upload your project(s) as one project page on Ravelry with the tag ESKTriathlon2015. There are loads of great yarn options for these in the shop, but a few suggestions: Madelinetosh Silk Merino for a luxurious project, Cascade 220 Superwash for a more affordable approach, Three Irish Girls Springvale DK for a super variegated yarn, or Juniper Moon Herriot for a more rustic feel. 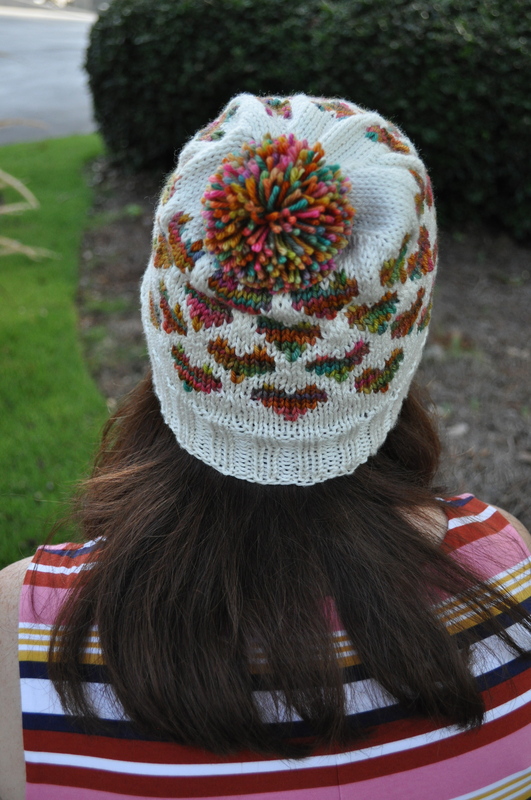 Erin knit up her Yarnicorn hat in just a few days using Silk Merino in Natural and Springvale DK in Luau for the hearts and bonus pom pom. For this challenge, we want you all to show your mascot around your hometown! We have created a list of scavenger hunt locations for you to snap a picture of your mascot (and maybe you) and share with all of us! Many of you have already knit the MochiMochiland mini mascots so these will come in handy for this challenge. You can also print one of the thumbnails of your mascot here and use that. Your set of pictures will earn 1 point for featuring printed mascots, 2 points for featuring MochiMochiland mini mascots, and 3 points for featuring both MochiMochiland mini mascots AND you in your ESK t-shirt. You may only earn 3 points if you have knit the mini mascots, you cannot use the printed mascots and you in your ESK t-shirt to earn the maximum points. This is a scavenger hunt for only your team’s mascot. You may not earn points using other team’s mascots. Submit your pictures on this Ravelry thread. May the Ravelry boards light up like a Christmas tree and let the games begin! Have fun! Savannah is a wonderful coastal city in southern Georgia known for it’s beautiful parks, stunning architecture, streets lined with mossy trees, haunted cemeteries, and rich history. When visiting, it is like you step back in time as you wander down the cobblestone streets and drink sweet tea out of a mason jar. Savannah is famous (possibly infamous) for its huge St. Patrick’s Day festivities where the green beverages are flowing like the broad Savannah River! Here is Jessica telling of her wedded bliss adventures in Savannah! My husband Josh and I chose it as the starting point for our honeymoon-road trip up the east coast, and always make a point to stop and visit when we vacation on Tybee Island. I really enjoy exploring the city, it always seems like there is something new to discover! There are many museums and lots of fun tours you can take as well, including a delightful trolley tour, riverside boat cruises, and quite a few ghost tours- there is even a “Midnight in the Garden of Good and Evil Tour“! Of course, there’s also no shortage of delicious food to be found aroundthe city, and there must always be a stop by River Street Sweets! If you visit Savannah, I highly recommend staying at a bed & breakfast. Grab a sandwich at Zunzi’s, and take your time soaking in the beautiful azaleas and Spanish moss. Definitely stroll through Bonaventure Cemetery, and enjoy everything the historic district has to offer! Savannah is available in the following bases: TML, Pashmina, Tosh DK, Tosh Vintage, Tosh Sock and Twist Light.